As well as supporting Attack Attack! on their US tour later this year. 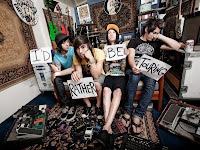 Pierce The Veil will also join the band for the Take Action Australia tour. Dream On, Dreamer will also be playing on the tour. In addition Pierce The Veil will be touring Japan with Confide, Bury Tomorrow, Crossfaith, and Lost.